Stephen Sackur of BBC’s Hard Talk interviewed the Catholic Church’s most senior cleric in the Philippines, Cardinal Luis Antonio Tagle. Is the Catholic Church helping the nation’s development? Manila – Catholic in Asia spoke briefly on the phone to Colombo with Father Cyril Gamini Fernando, National Director of Catholic Social Communication in Sri Lanka on Friday, Dec. 5, to get the local Church’s perspective of concerns raised by Catholics who are pushing for the postponement of Pope Francis’ January 2015 visit to their country. 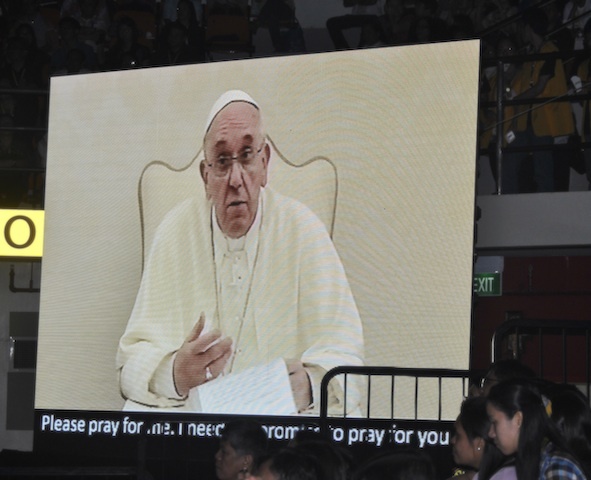 Catholic In Asia : What was the outcome of the meetings with the Vatican papal visit team that went there after the schedule of early elections next year was announced ? 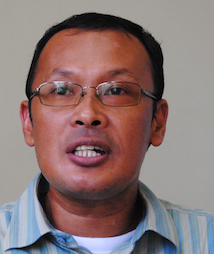 Father Cyril Gamini Fernando: The Vatican team did not come here in connection with the elections. They have come here to check on the preparations for the papal visit. That is the normal thing. They do the same thing in Manila also. They arrived day before yesterday (Dec. 3) and they have left already. As of now there is no change in the schedule of papal visit events. What is the response of Sri Lanka Church officials to concerns of Catholics detailed in published letters and statements? What is Cardinal Ranjith’s response to these, and to “politicization” of the papal visit ? We have requested all parties connected with these elections that they should not use these as election tools, whether their pictures with the pope or anything showing the papal visit. So we have asked if there are already such pictures displayed outside or in online accounts, they should remove them all. We have told that to all parties. What about anticipated violence around the time of the polls? How does the local Church see this? Election day is on the 8th (January) we have about six days ‘til the 13th to open the ballot and count and declare the president before we will welcome the Holy Father for the visit. What assurance can local Church organizers give for the safety of the pope and people who will be around the venue of papal visit events? We have faith in God and we have asked the people to pray and prepare spiritually for the visit because it is primarily a spiritual event. Women theologians in Asia have been sustaining the process of reflection and dialogue on feminist issues and concerns through conferences, symposia, artistic exhibits and publications. Out of this movement came an association of theologians called Ecclesia of Women in Asia (EWA) that formed 12 years ago. Theologian Agnes Brazal, director of the Office for Research and Publications and coordinator of the graduate program at St. Vincent School of Theology in Quezon City was among participants of the first conference, and has served as joint treasurer since 2005. The association is calling for papers and presentations for its Seventh Biennial Conference in Manila in January 2016. The conference will be the association’s first under Pope Francis, who has issued a call to make room for a more incisive role for women in the church. Read Brazal’s description of the founding of EWA and discussion of the importance of feminist voices in the Church. Franciscan Sisters of the Immaculate Conception Sister Crecensia Lucero reflected on her ministry with victims of human rights violations spanning more than 40 years. The journey she traced is marked by work she and young sisters and lay partners did to serve needs of political prisoners and their families during years when the country was placed under military rule (1972-1981) and years of “restored democracy” that followed. The road has brought her to an expanded ministry thriving in partnerships with farmers struggling to transform exploitative systems, indigenous peoples and members of other sectors collaborating to end people’s suffering due to various forms of “injustice ” around Asia. 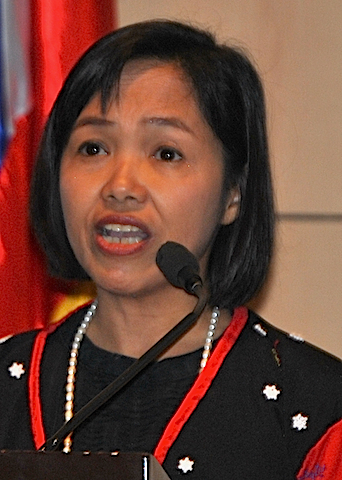 In an interview with Global Sisters Report (GSR), Sister Lucero explained challenges, successes and “heartaches” in the history of Task Force Detainees of the Philippines (TFD). As co-chair, she describes how evolving challenges are impacting perspectives and strategies of her social justice ministry and the charism and mission of her congregation. Beyond words and ideas, however, she demonstrated these concepts and strategies in various dialogues and training seminars GSR covered earlier in the year. Read full interview published by GSR. GSR is a project of National Catholic Reporter that reports how consecrated women participate in the mission of the Church. 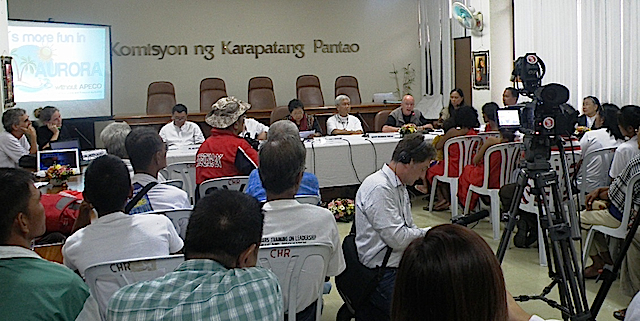 The Association of Major Religious Superiors in the Philippines (AMRSP) established TFD in 1974 to assist political prisoners when the “dictatorship” of the late President Ferdinand Marcos banned organizations. TFD provided moral spiritual, legal and material support to prisoners and their families. Franciscan Sister Mariani Dimaranan, an ex-political detainee, directed the organization until 1989, when Lucero took over as director. 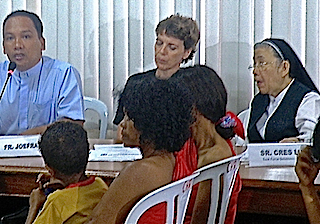 Sister Dimaranan continued as chair until her death in 2005 at the age of 81 years. 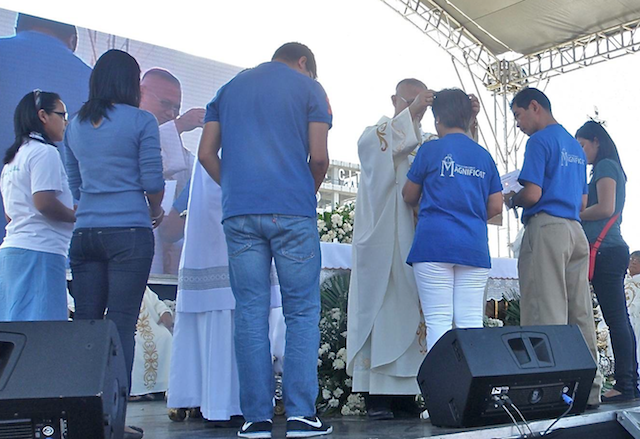 In 2012, Sister Lucero was again nominated co-chair of the Task Force’s Board of Trustees with Order of Carmelites Philippines Father Christian “Toots” Buenafe up to this year. 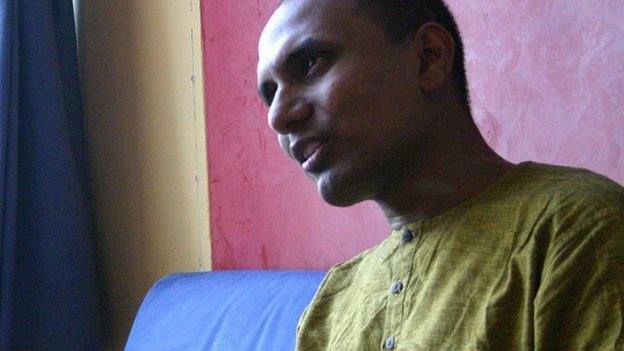 Ruki Fernando out of detention – is he free? Human rights defenders Ruki Fernando and Father Praveen Mahesan are out of detention in Sri Lanka’s Terrorist Investigation Department (TID), but Fernando, in conversation over the phone from his home in Colombo told me hours after their release, he does not feel completely free. Police arrested Mahesan and Fernando on March 16 evening from Kilinochchi in northern Sri Lanka while the two were on a fact-finding mission in the area. They were taken in Tharmapuram near the home of Jeyakumari Belndra who was arrested a week earlier for allegedly harboring an absconding Tiger. After being interrogated “harshly” in Kilinochchi and nearby Vavuniya, the two were finally detained at the TID headquarters in Colombo. A few hours after Fernando’s release, he shared his sadness over continued “unjust” incarceration and maltreatment of other detainees mostly from north and northeast Sri Lanka. Rebels based there fought the government for a separate state until they were violently defeated in 2009. Fernando expressed his and Fr. Mahesan’s gratitude to local and international NGOs, religious groupings, human rights bodies and governments around the world for throwing their support behind them and for demanding their release. The detainees freed last March 19 give credit to the pressure exerted by this movement for their release and safety in the hands of the police and interrogators. Soon after this interview, the Sri Lanka government barred Fernando from giving interviews to foreign media. N.J. Viehland : Exactly when were you released? Ruki Fernando : It was about 1:30 this morning in Sri Lanka. We were trying to do some fact finding about the human rights situation from war affected areas of the Kilinochchi district. When we were there on Sunday it was very very tense. During the whole Saturday and Sunday we were there. We encountered many many checkpoints which was not very usual because we had traveled in that area before. We were stopped in several places. We were detained for 15 minutes, 20 minutes in certain places, our identity card numbers were taken. When we went to visit someone in a house the army came and questioned us. That’s quite unusual that when we visit a person the army would come into the house and question you – a person in uniform and someone in civilian clothes. When we went on to visit another lady, that lady was already being questioned by intelligence officials so we could not enter in her house. So throughout the one-and-a-half days we were intimidated. We faced restrictions and surveillance, and it was a very very tense situation. Then finally, it was around 10 pm on Sunday that were arrested. Initially we were told that it was in relation to a shooting incident. Then we were told later that we were arrested in relation to supporting terrorism. We were questioned very very intensely. It was very harsh. We were not given access to our lawyers while on detention, although I made several requests. When we were first arrested I made a request. Later I requested to get a senior official of the terrorist investigation department … that I want to talk with my lawyers. But throughout detention I was not given the opportunity. Many lawyers came to meet me, but the police did not allow any of them to meet me. I learned I got lots of attention to this in Sri Lanka and also internationally and because of the many requests for the Sri Lanka government to release us from Sri Lankan organizations, individuals and also organizations and people around the world, and I believe because of that our safety while in detention was ensured. We were not physically harmed and eventually our release is also due to the work and the pressure exerted by so many people in Sri Lanka and all over the world. Any faith-based group that demanded your release? Yes, one of the northern dioceses, the Jaffna diocese issued a statement from Catholics calling for our release. There are many individual priests who were also lobbying for us. But I don’t know if the archbishop of my diocese, (Cardinal Malcolm Ranjith) Colombo, has done something that I don’t know about. I know that it was brought to his attention and that there were requests from some people that he would make some intervention because he is very influential with the government. Fact finding mission – who were you with and what were you investigating, exactly? We were investigating the very tense situation. We wanted to know why it was so tense. We were looking into allegations of arbitrary arrests of several women in the north and the east during the week. That time we had heard of the allegations so wanted to do a fact-finding and also to get a sense of what the situation was on the ground. Kilinochchi was the center of the LTTE (Liberation Tigers of Tamil Eelam), but we were not only in Kilinochchi town but also in the interior areas because we wanted to check them out. People in that area and also from outside had been telling me there was this situation of tension and arrests and so we wanted to go and look. Apparently two women who were connected in some way to this person annexed to the key leader for the revival of the LTTE, one was his wife and another was also known to him were under surveillance or arrested. Then the third person is also a woman. We got reports of their arrest. The government is very edgy – the police and the army. I don’t know if it is justified or not because I don’t have information, but according to what the police and army told me they are treating it as a very serious threat. You think this reported revival of LTTE has something to do with your arrest? No. I think the government does not want the true situation in the northern part to be known to the rest of Sri Lanka and the rest of the world. The government does not want any different story than their own version to get out, and the government is particularly clear that no information should be provided to the UN Human Rights Council currently in session in Geneva. During questioning they were even asking me who are you sending this information to. In fact one of the three leaders who came to arrest me, he was saying I am sending information to earn money. That was one of their acusation. Another is that I am causing discomfort to the government. This is in writing. So I told them I don’t understand how these can be a crime. What were conditions in detention? We were kept in an office the whole day. We were separate. There were few occasions that Father and I could talk to each other but they kept us separate. When we would start to talk about something, we would be separated again. We were kept in the Terrorist Investigation Department (TID). Why and how were you released? They arrested and brought us to the station. Then the police finally decided that they had nothing to show to the court. So they wrote the court that they had nothing against us and they requested for our release. So the magistrate released us accordingly. They signed the request from the police. Where are you now and how are you and your family feeling about all this? I’m with my parents now in Colombo. It’s nice to be back. My parents and my sister were very very worried. Starting now they are already relieved, but still quite worried about my safety in the future. What are next moves for you and Father Mahesan? It’s too early to say. Father and I have to still discuss with our lawyers and the people who worked very hard to get us released. We will discuss together and decide on next steps. But one thing that is clear for me and for Father is that we remain very committed to the work we are doing. We were doing what we believe in, that we are doing the right thing. Both of us are Catholic, he as a priest and I a lay person, both of us essentially living our Christian faith so I think we will take these as part of our Lenten pilgrimage, these two days, and we will not be deterred by what has passed, and we will continue to work for human rights. Any message to people who lobbied for your release? First, my very great appreciation on behalf of me and on behalf of Father Praveen as well. I’m very very sure that our safety while in detention and our release is because of the work that all of our friends in Sri Lanka did, as well as the media, human rights organizations and even some foreign governments speaking on our behalf. It shows that if ordinary people, organizations and governments want to, they can actually make a difference in terms of providing safety to people who are in danger, ensuring that people who are detained unjustly are released. It is a very good example of what can be achieved if people are committed. Very sadly, when I and Father Praaveen walked out to be free men, we left behind the many people who have been detained in the very place we were detained, and those men and women have been detained for much longer than us. Those people do not get even one percent of the attention that Fr. Praveen and I got. So I wish there will be more people who will join Father Praveen and I to ensure the safety and freedom of many other people who are unjustly detained. N.J. Viehland: What is the basic definition of mission? Fr. Andrew Recepcion: Mission is both a journey of faith and a sharing of faith. Journey of faith because it involves a personal encounter with the Lord and you cannot give what you do not have. Sharing of faith because we cannot keep that Spirit of God to ourselves. We have to share it with others. What are particular challenges to the Church in the Philippines? The constant challenge to the Philippines Church is that it is always an island of faith. For many many years, we have been “the only Catholic country in Asia,” though now there is East Timor, but there’s still much for us to do. It’s very important that Catholic Christians in the Philippines will go beyond the comfort zones of family tradition and commit deeply to proclaiming Jesus Christ in different situations. We also have to balance mission “ad gentes” (to the nations) or mission “going to places that need explicit proclamation of Jesus Christ,” with mission as a way of life. And only when mission becomes a way of life among Filipinos can they make a difference in evangelization in Asia today. Talks and sessions of the Grand Mission Festival sought to inculcate that awareness that mission is a way of life, and that every Christian wherever we are, can do evangelization and the Church’s missionary work. We don’t have to go right away to places outside the Philippines to do mission, but we start with our families, with our work environment, schools and so on, and then we begin to create a mission culture, so to speak, and that could facilitate mission ad gentes. So many times, we have the impression that those who volunteer or do full-time mission work are extraordinary. In reality, it should be ordinary for us Christians to do mission because as John Paull II reiterated in Redemptoris Missio, mission is an instrument of faith and we will lose that faith if we don’t share it. But, it should not be understood as sharing it only to those outside our territory. There’s a tendency even among priests to reduce mission to going to other nations. The need for that should not be denied, but mission is beyond geography. Every person that God places beside me in this present moment of my life is my mission space and you have to be there for that person. That’s the revolution that should be understood at this time. What are the implications for orientation and training for mission? Preparation for mission is “here” in the manner that we live out our faith, in the manner we share it with our family, with people who are close to us. Only when we are able to mature in this kind of missioning that we can eventually be committed to mission ad gentes. From experience I see it has to be understood by priests that mission is not added work. For many priests, their concept of mission is that it is an activity that has to be done, when in fact mission should be the soul of pastoral work. Without the orientation to mission, pastoral work is reduced to empty administration work and other activities. If we do not do mission, we are not missionaries of Christ carrying out our pastoral work, but end up instead as social workers, organizers, event managers, CEO. How important is it to include formation for mission in the seminary program? Mission formation must be allowed to mature in one’s life. It’s important for seminarians to understand that they are becoming priests not just to do pastoral work, but to participate in the mission of the Church. Your pastoral and other work is part of the whole mission enterprise of the Church. For this mission, seminarians must nurture an attitude of availability for mission and joy of service. Their formation is programmed so that mission is intuitive. They are given exposure to mission situations in the diocese to understand that being in the parish is not merely celebrating the rituals and performing sacraments, but that all these and other activities are a constant life-giving witness to the faith. Aside from seminarians’ mission formation program, we also have had the Caceres Mission Aid Program since 1997. We have 16 priests right now who serve 3-year contracts with mission dioceses. Almost 50 of our 280 priests have gone to serve overseas. What did the Grand Mission Festival achieve? Mission is not result-oriented because the proclamation of the Gospel is always open-ended. The fruits are given not by any human effort but by the Holy Spirit. I think the fruit of the Grand Mission Festival, from the human point of view, was its succes with the organization, participation, also with the good general program. From the point of view of God’s work, the fruits will have to be reaped in the future through the success of lay missionaries that were sent off to their missions. We hope that they will be able to inspire others and witness to Jesus, and that more missionaries will be sent from the Philippines. Was there enough discussion of the role of dialogue in the mission of the Church? 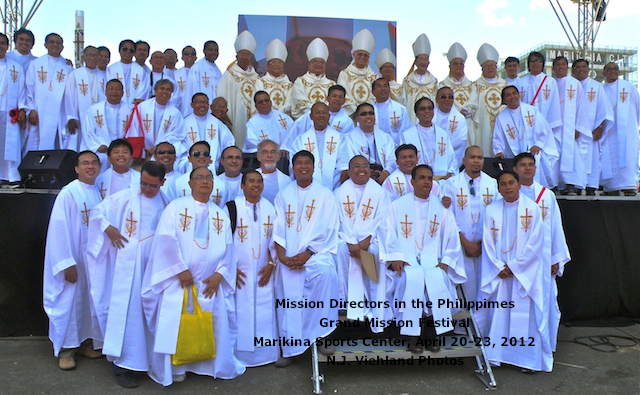 Grand Mission Festival focused on PMS and that covers mission more as the work of the Church. Maybe at another time it would be opportune to talk about dialogue. But in the Philippines dialogue is always part of our understanding of mission because of growing religious and cultural pluralism in the country. How do you respond to claims that some bishops, priests and Religious are not open to dialogue? Even today, there are priests and bishops who do not want to talk about dialogue because of our training to fight for our faith as much as possible and as far as we can prevent it, our faith should not be contaminated by other religions. We cannot proselytize and aggressively convert Muslims. In a pluralistic situation, the challenge to Filipino Christians is to know more our faith and identity because if not we could be converted. How do you see the conversion of Catholics to Born Again and other groups? As far as I know, Born Again groups are very active, even in remote areas. For many people who have been in the margins of Church life – who we call the “un-churched” – they feel liberated by the manner in which Born Again Christians create a Pentecostal atmosphere in presenting the faith. For many it’s like liberation from a very traditional way of living faith and of liturgy. For example, they could spontaneously praise God. It’s very important that Catholic Christians are also able to live their faith without having to join Born Again Christians. If they only knew that there’s so much of the movement of the Spirit in our lives. If we only put the Gospel into practice, our faith can be as alive. Catechesis and basic education are important and it’s very important the very basics of our faith are clearly and deeply understood, including the basic question: Why do we believe in God?